The Bible is more than a collection of heartwarming sayings; it is the grand revelation of God and his worldview, designed by him to help us know him and live godly lives (2 Timothy 3:16-17). Yet how many believers read the whole Bible (Old and New Testaments) with the expectation that God will use its contents to effectively equip them for all of life? Understand our world from God’s perspective. Discover how the centrality of Israel in God’s plan integrates the whole Bible and provides a foundation for all of life. See how the coming of Jesus as Israel’s Messiah is the fulfillment of Old Testament expectation and enables us to truly know God and live life the way he intends. Realize that the Gospel is much more than an individualistic spiritual experience; it is an invitation to be part of God’s transformational, world-wide mission. You will want to read the whole Bible like never before! Session 1: 7 – 9:30 p.m. Session 2: 9 – 10:15 a.m. Session 3: 10:30 – 11:45 a.m. Session 4: 1:15 – 2:30 p.m. 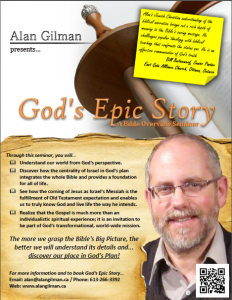 Session 5: 2:45 – 3:30 p.m.
To book God’s Epic Story or for more information, contact Alan now!